Digital transformation may also come across as some sort of esoteric subject, with only learned experts able to navigate the pitfalls of how to get it right. And it can also be the kind of thing that grinds organizations to a halt or enables significant growth – at the same time, no less! In reality, it is all of these things and none of these things at the same time. The bottom line is this: The concept of digital transformation is something that all growth organizations need to embrace, but it is how you plan for it that will define not just the path that the organization takes to bring it to life, but the narrative for how the transformation story is told. The concept of digital transformation is something that all growth organizations need to embrace, but it is how you plan for it that will define not just the path that the organization takes to bring it to life, but the narrative for how the transformation story is told. Most organizations can be classified into four broad categories of digital maturity, with Digital Capability and Leadership Capability having equal weighting on the maturity model. Beginners are just starting their journey into being a digital enterprise and Conservatives have set the stage for it, but need to push further with innovative digital capabilities. Fashionistas, on the other hand, have pockets of mature digital capability, but not the underlying cultural maturity for it to be completely pervasive in the organizations. 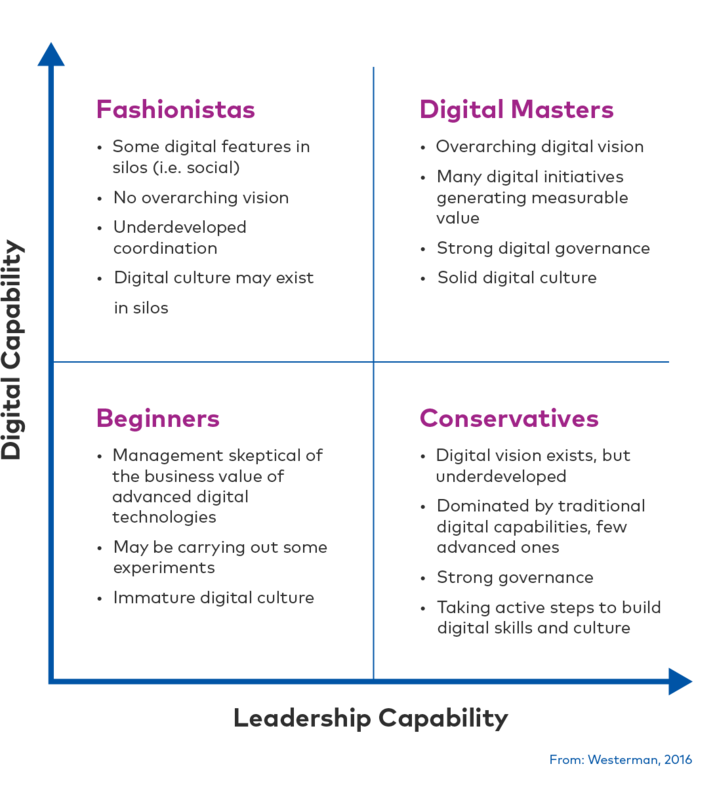 Digital Masters are the ones that blend digital capability and leadership capability to achieve the best operating execution premium. In fact, Digital Masters are shown to be 26% more profitable and generate 9% more revenue from their physical assets, relative to their industry peers, the result of the complementarity of digital and leadership capability in a healthy blend. Although no two businesses are exactly the same, there are consistent key elements of digital transformation that exist within the enterprise. These are segmented in to three key areas: Customer Experience, Operational Processes and Business Model. Within the Customer Experience theme, Customer Understanding is about using analytics to provide a richer and more accurate representation of your customer segments, while at the same time using social technologies to be more informed about what your customer segments are thinking and doing. Top Line Growth is about using digital technologies to enhance and speed up the selling systems employed by your front-line workers, and using other digital technologies to streamline the customer onboarding process. And Customer Touch Points is about improving customer care, enhancing customer self-service and making sure that your digital brand matches your physical brand. The Operational Process theme is about streamlining operational processes to increase efficiency. 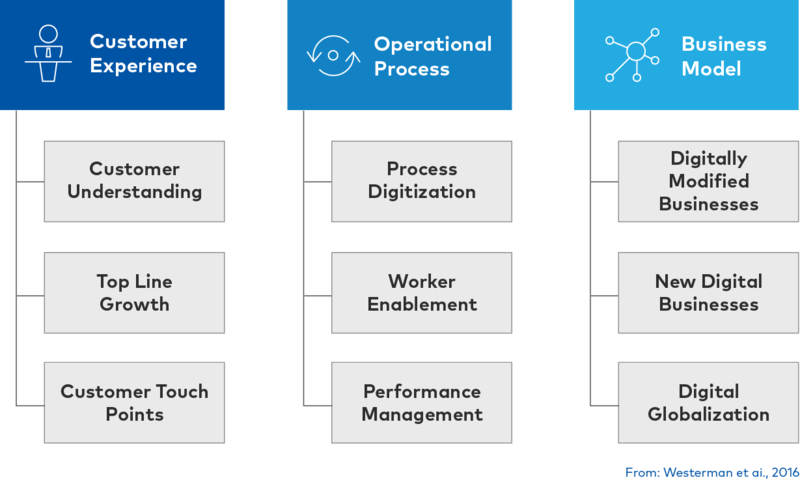 Process Digitization is all about productivity and performance improvement, new process development and the development of new ways of doing things. Worker Enablement is also expressed in this theme through “work anywhere” capability, better and faster communications, and improved knowledge sharing across the enterprise. And Performance Management brings focus to operational transparency and the enablement of data-driven decision making. The Business Model theme pertains to how companies can exploit digital for new business opportunities. Digitally-modified Businesses bring to life service or product augmentation through digital, sometimes transforming product entirely or just wrapping a physical product in a digital wrapper. New Digital Businesses may create new digital-only product, which can lead to organizational redesign – reshaping how the company is organized so that digital can be properly exploited. And Digital Globalization is more about enabling enterprise integration across a large geographic area, which may include a redistribution of authority and will certainly include the sharing of digital services. If leadership capability exists, the process of becoming a digital master is not as simple as just going out and buying technology. There is absolutely a process involved that sees process, culture, attitude, capability, and management style reshaped over time so that the transformation is one that is not just deliberate, but also sustainable. Generally speaking, most organizations go through a multi-phase process to digital mastery. There is no specific timeline requirement for this process, but going through these steps will ensure that change that is made is change that is embraced and adopted. Business as Usual: Organizations operate with a familiar “business as usual” perspective of customers, processes, metrics, nosiness models and technology, believing that it remains the solution to digital relevance. Present & Active: Pockets of experimentation are driving digital literacy and creativity, albeit disparately, throughout the organization while aiming to improve and amplify specific touchpoints and processes. Formalized: Experimentation becomes intentional while executing at more promising and capable levels. Initiatives become bolder and, as a result, change agents seek executive support for new resources and technology. Strategic: Individual groups recognize the strength in collaboration as their research, work and shared insights contribute to new strategic roadmaps that plan for digital transformation ownership, efforts and investments. Converged: A dedicated digital transformation team forms to guide strategy and operations based on business and customer-centric goals. The new infrastructure of the organization takes shape as roles, expertise, models, processes and systems to support transformation are solidified. 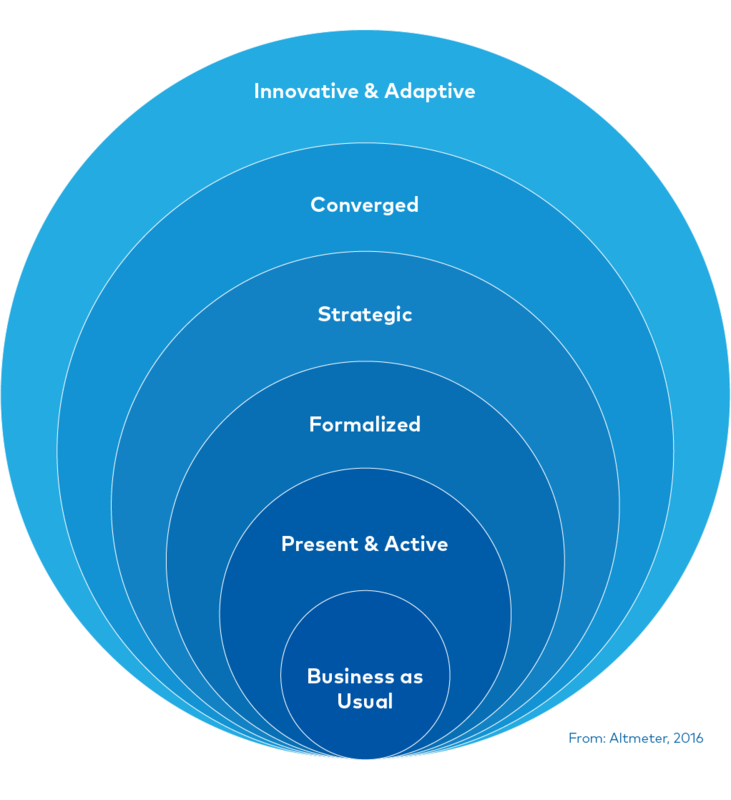 Innovative & Adaptive: Digital transformation becomes a way of business as executives and strategists recognize that change is constant. A new ecosystem is established to identify and act upon technology and market trends in pilot and, eventually, at scale. Digital transformation can be one of the biggest change management challenges organizations will face. It impacts business on every level, from industry structure to day-to-day operations. Change management is not just processes and technology – it’s also about how the attitude and behavior of those engaged in the processes and using the technology will determine the success of the transformation. According to the Altimeter Group (2016), the enterprise drives digital transformation for many reasons, including risk mitigation, customer demand, compliance requirements, growth in new markets, and competitive pressures. But one of the organizational areas that sees immediate impact is the employee base, with 37% reporting improved employee morale within 3 months of transformation. Somewhat paradoxically, employees can also be a barrier to successful digital transformation if their needs are not planned for properly. With proper planning, this risk can be mitigated through a common-sense approach that includes involving influencers in the transformation process, rewarding early adopters, developing reliable training materials and by communicating wins early.